A solar superflare could knock out our global electricity supply and send us back to pre-industrial times, with households using candles for lighting and washing clothes by hand, say researchers from the University of Warwick in the United Kingdom who analyzed a superflare from a star with similar physics to those of our Sun. Our current hi-tech civilization depends on electricity for just about everything. Without it, most of the things we do and rely on would grind to a halt. Study leader, Chloë Pugh, a PhD student, and colleagues studied a stellar superflare. Stellar refers to stars, while solar refers to our Sun. A stellar superflare is one produced by a star, while a solar superflare would be one produced by the Sun. An artist’s depiction of a superflare. In 2015, NASA’s Swift satellite spotted a stellar superflare on a nearby star so powerful that, had it been from our sun, it would have triggered a mass extinction on Earth. Stellar superflares are colossal magnetic eruptions in the atmosphere of stars – mega explosions that can occur on solar-like stars, which are thousands of times more powerful than normal solar flares. 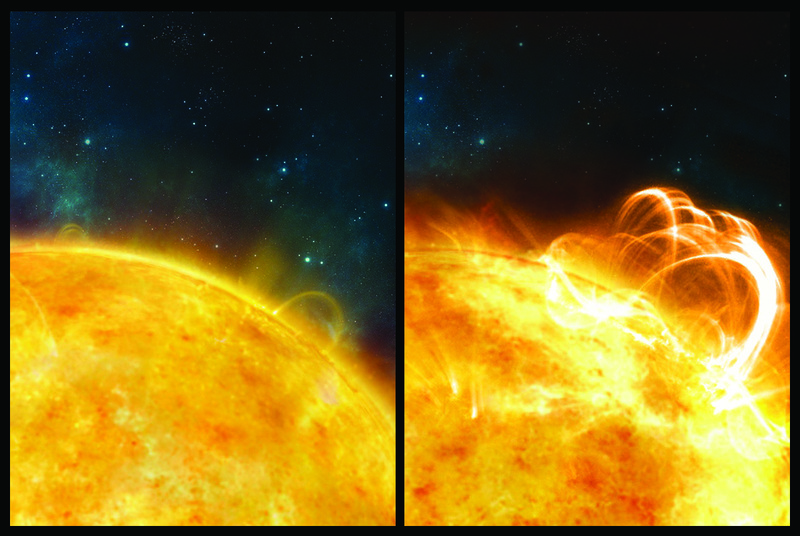 Scientists at the University of Warwick’s Centre for Fusion, Space and Astrophysics wrote about their observations and conclusions regarding a superflare in The Astrophysical Journal Letters, which the American Astronomical Society chose as its publisher. NASA’s Kepler space telescope, a space observatory launched in 2009 to discover Earth-like planets outside our solar system, detected a stellar superflare that had wave patterns similar to those found in the Sun’s flares, the scientists explained. The superflare was spotted in, a binary star – a star system consisting of two stars – called KIC9655129. KIC9655129, which is in the Milky Way, is known to sometimes produce superflares. The authors wrote that its superflares are similar to solar ones, so they both probably share the same underling physics of flares. Given everything we know about our Sun, there is no reason why it should not have the capacity to produce mega-powerful superflares too. An average solar flare is already pretty powerful – with the energy-equivalent of about 100 million megaton bombs. But that is nothing compared to a solar superflare, which would have the energy-equivalent of at least 100 billion megaton bombs. Such power coming out of the surface of the Sun and heading towards Earth would be devastating. The explosion from a superflare would not only produce a surge of visible light, but also a huge cloud of charged particles and detached magnetic loops – a ‘CME’ (coronal mass ejection) – that would be hurled directly towards Earth. According to NASA Science, when the CME arrived, it would crash into our planet’s magnetic field, causing a global bubble of magnetism that surrounds Earth to shake and quiver – there would be a magnetic storm. Our electric cables would instantly start producing sparks and would then catch fire, possibly across the whole planet. GPS and communication systems and the electricity grid would be knocked out. For modern, tech-dependent civilization today, the consequences would be catastrophic. Power blackouts across the planet would mean that all of our computer systems would grind to a halt. Traffic controllers would no longer be able to guide airplanes in and out of airports or through busy traffic routes, flying aircraft would not be able to navigate and perhaps even their flight systems would fail, our cities would have no functioning traffic lights, we would not be able to fill our cars with fuel because the pumps would be out of service. Our hospitals would be in trouble because medical devices and laboratory equipment, as well as elevators and other machines need electricity to function. Back-up generators could only help for basic services. How would doctors, nurses and other hospital personnel get to work on time with no functioning traffic lights, etc? Millions of factories would not be able to operate. Hundreds of millions of people worldwide would have to be laid off until we restored our electricity supply. In this study, the scientists used time series analysis to examine wave patterns in the light curve of a superflare from KIC9655129, using data gathered by the Kepler space telescope. Their analysis revealed two significant periodicities, with a less than one percent probability that they would be observed by chance. Another Carrington Event today would start with spectacular sights in the sky, followed by a period of darkness and great suffering for humankind. A large solar flare caused the largest solar storm on record in 1859. It is known as the Carrington Event, named after British astronomer Richard Carrington (1826-1875) who witnessed the massive solar flare. He was the first person to identify a link between the Sun’s activity and geomagnetic changes on Earth. During the Carrington Event, the Northern Lights (aurora borealis) could be observed as far south as Cuba and Honolulu, while the Southern Lights (aurora australis) were visible as far north as Santiago, the capital of Chile. Telegraph wires and equipment produces sparks, people said, and in many causes there were fires. The Carrington Event caused some problems in 1859. But in those days there were no computers, cars, airplanes, electric lighting in homes, telephones, Internet, and other hi-tech things we rely so much on now. Such an event today would push us back centuries, and it would take several weeks, months and perhaps years to get things working properly again. The research was funded by a European Research Council project that co-author Professor Valery M. Nakariakov led. Citation: A. -M. Broomhall, C. E. Pugh and V. M. Nakariakov. “A Multi-Period Oscillation in a Stellar Superflare.” The Astrophysical Journal Letters. DOI: 10.1088/2041-8205/813/1/L5. In January 2014, NASA’s Interface Region Imaging Spectrograph witnessed an M-class flare, the strongest it had seen since it was launched. A superflare would be thousands of times more powerful than this one.